Epigenetics refers to changes to gene expression or function that do not include genetic mutations, i.e. changes to the DNA code. For the past 100 years or so scientists have assumed that any evolution in a population of organisms requires a change in DNA. Recent work, however, finds that structures associated with DNA can change gene expression and thus phenotype. Some of these epigenetic changes are induced by the environment and can even be heritable, which means they are a potential other mechanism of adaptation to environmental conditions. The Galápagos Islands have experienced a period of rapid environmental change in recent years due to the increase in tourism and development on the islands. In a recent paper, colleagues and I investigated the effects of urbanization on Santa Cruz on two species of Darwin’s finches: medium ground finches (Geospiza fortis) and small ground finches (G. fuliginosa). We compared DNA methylation in blood and sperm cells of finches living near the biggest city in the Galápagos, Puerta Ayora, to finches that lived in relatively undisturbed habitat about 10km away. We found a number of notable changes between populations: both species had DNA methylation differences between urban and rural populations in both blood and sperm. In one species, G. fortis, we saw that urban birds were significantly larger than rural birds. But in neither species did we see genetic differentiation between urban and rural populations. These results suggest that ground finches are responding to environmental changes around Puerto Ayora and that DNA methylation may be involved. Both small ground finches (left) and medium ground finches (right) show epigenetic changes between urban and rural habitats. A heavily parasitized mockingbird chick. 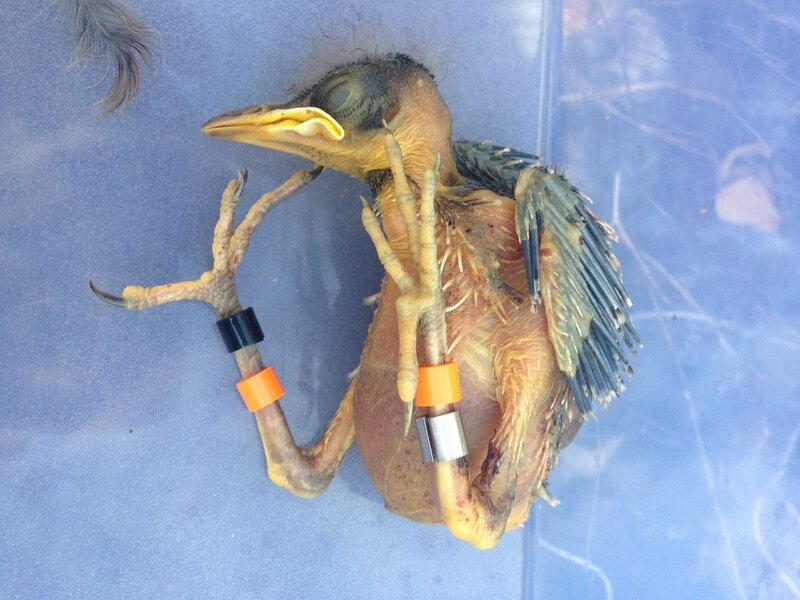 Do epigenetic changes differentiate those mockingbirds that survive from those who die? Can DNA methylation changes help hosts respond to a new, virulent parasite? In collaboration with Christina Richard’s Lab at the University of South Florida I am investigating the epigenetic effects of P. downsi on Galápagos mockingbirds. I am using samples collected during four years of field study during which P. downsi had drastically different effects on mockingbirds to investigate potential methylation changes. DNA methylation changes may reflect stress on the nestlings as they grow from parasitism, or potential mechanisms of tolerance as the nestlings recover from P. downsi. Stay tuned for results!